In addition to the above supported databases, CDH also supports using MariaDB. For information about installing and configuring MariaDB for CDH, see Install and Configure MariaDB for Cloudera Software. For information on configuring heap for Hive metaStore, as well as HiveServer2 and Hive clients, see Configuring Heap Size and Garbage Collection. 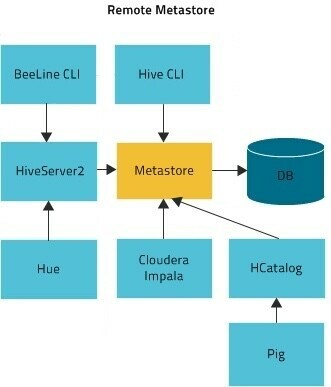 Cloudera recommends you configure a database for the metastore on one or more remote servers that reside on a host or hosts separate from the HiveServer1 or HiveServer2 process. MySQL is the most popular database to use. Use the following steps to configure a remote metastore. If you are planning to use a cloud service database, such as Amazon Relational Database Service (RDS), see How To Set Up a Shared Amazon RDS as Your Hive Metastore for CDH for information about how to set up a shared Amazon RDS as your Hive metastore. Note: If the metastore service will run on the host where the database is installed, replace 'metastorehost' in the CREATE USER example with 'localhost'. Similarly, the value of javax.jdo.option.ConnectionURL in /etc/hive/conf/hive-site.xml (discussed in the next step) must be jdbc:mysql://localhost/metastore. For more information on adding MySQL users, see http://dev.mysql.com/doc/refman/5.5/en/adding-users.html. Note: Do this only if you are not using the Hive schema tool. Note: The hive.metastore.local property is no longer supported (as of Hive 0.10); setting hive.metastore.uris is sufficient to indicate that you are using a remote metastore. Note: This configuration is applicable only for a network listener. Using this configuration does not open all your databases to the entire world; the user must still supply a password to authenticate himself, and privilege restrictions configured in PostgreSQL will still be applied. Note: If you are running these commands interactively and are still in the Postgres session initiated at the beginning of this step, you do not need to repeat sudo -u postgres psql. The Oracle database is not part of any Linux distribution and must be purchased, downloaded and installed separately. You can use the Express edition, which can be downloaded free from the Oracle website. You must download the Oracle JDBC Driver from the Oracle website and put the JDBC JAR file into the /usr/lib/hive/lib/ directory. For example, the version 6 JAR file is named ojdbc6.jar. To download the JDBC driver, visit the Oracle JDBC and UCP Downloads page, and click on the link for your Oracle Database version. Download the ojdbc6.jar file (or ojdbc8.jar, for Oracle Database 12.2).